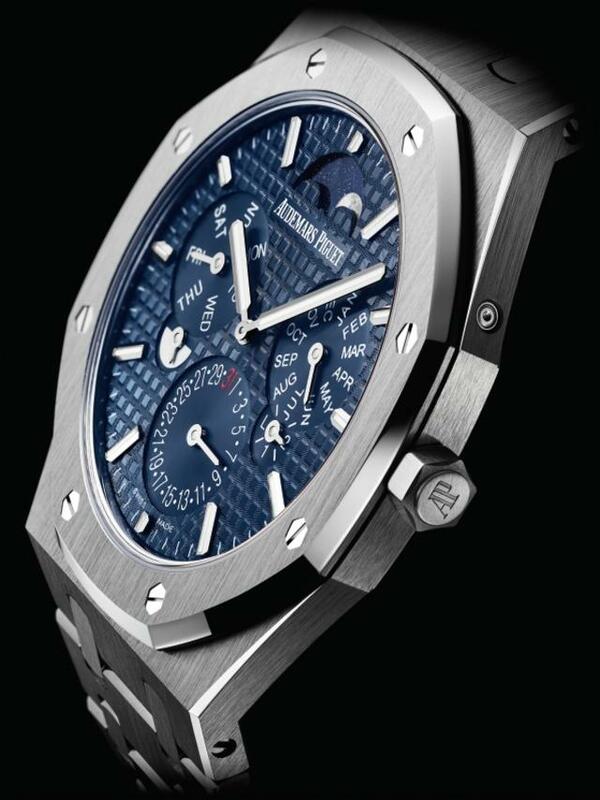 In addition to its previously released Royal Oak Offshore 25th anniversary pieces (the Tourbillon Chronograph and Royal Oak Offshore Chronograph) and a new series of Millenary models, Audemars Piguet’s 2018 debuts are full of new colors, new complications (including a first-ever flying tourbillon) and interesting finishes. Here are just three of the most intriguing debuts. We’ll show many more in the upcoming weeks as we digest the extraordinarily broad range of Audemars Piguet’s 2018 offerings. 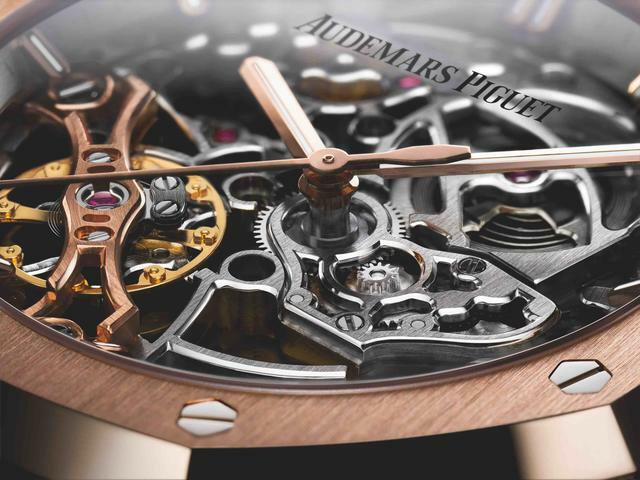 After five years of development, Audemars Piguet debuts this ultra-thin 5133 caliber with perpetual calendar, and wraps it around an all-platinum package. The result is not only the thinnest (just 6.30 mm thick) automatic perpetual calendar available, but quite possible the most handsome as well—with an eye-catching blue dial and Grande Tapisserie pattern. 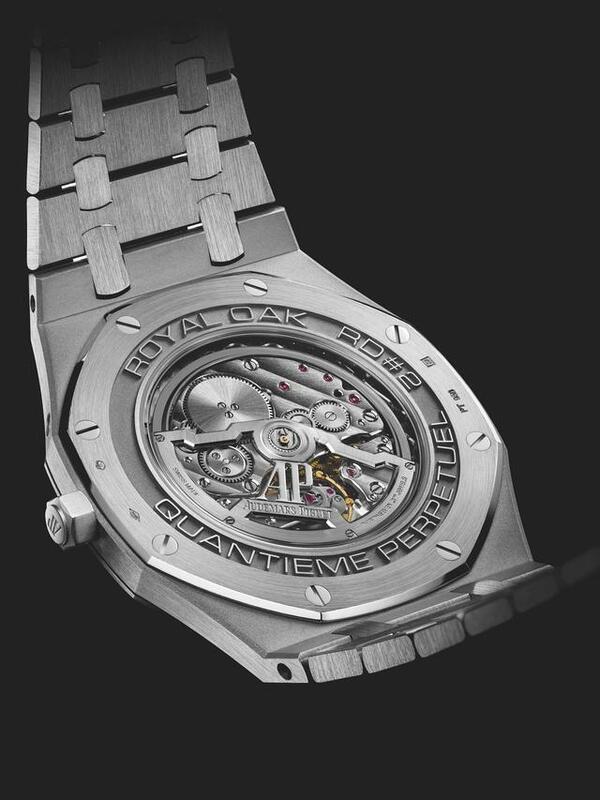 Audemars Piguet explains that to reach its goal watchmakers developed a patented caliber system that features a 2.89 mm central rotor depth and redesigned case that shaves almost 2mm off the earlier Royal Oak Extra-Thin Jumbo. The 12 o’clock moon phase of the new ultra-thin prototype pays homage to the company’s first perpetual calendar from 1955. Functions within the 41mm case include perpetual calendar with day, date, astronomical moon, month, leap year, night and day indication, hours and minutes. Royal Oak RD#2 Perpetual Calendar Ultra-Thin, side view. 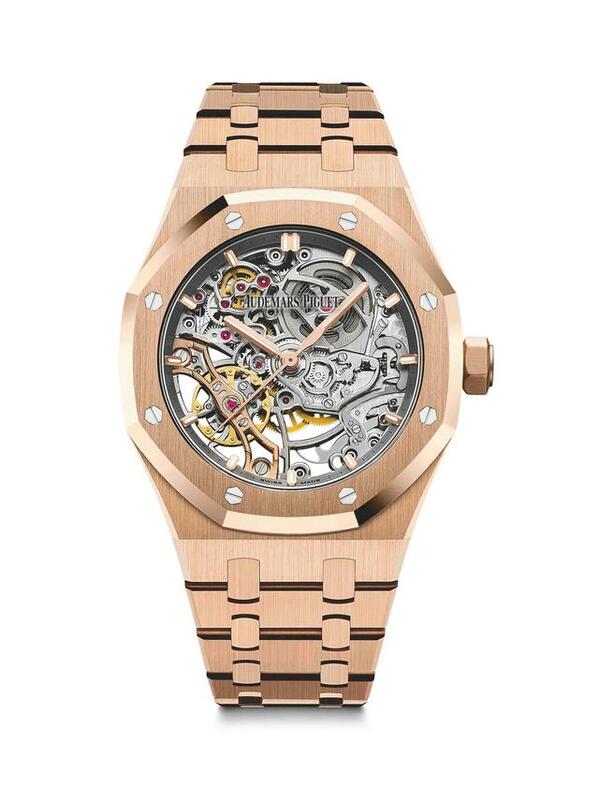 Royal Oak Double Balance Wheel Openworked in pink gold, now 37mm. Utilizing Caliber 3132, one of our favorite open-worked watches of the past few years, first seen in 2016 in a 41mm Royal Oak case, this new 37mm example offers a smaller frame for the skeletal beauty inside. The watch incorporates two balance wheels and two hairsprings that are assembled on the same axis. This allows the escapement to be visible from both sides of the case while also improving stability and precision---two adjectives not always aligned with open-worked calibers. Royal Oak Double Balance Wheel Openworked in pink gold, up close. 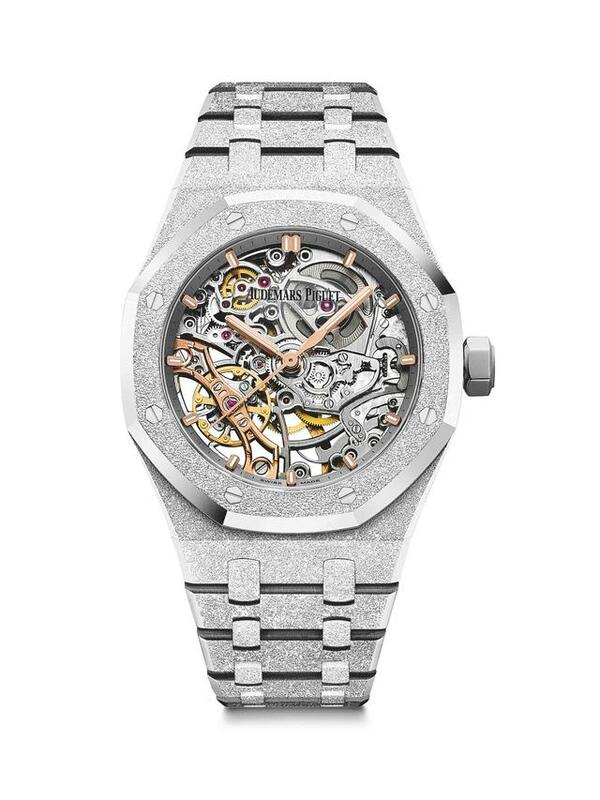 Audemars Piguet then rhodium-plates the whole work to better highlight the gold regulator and upper balance bridge, and finishes the bridges and mainplate hand with beveling, chamfering, polishing, satin-brushing and circular satin brushing. Two models will be made. One will be offered with a hammered white gold case/bracelet and the other made with a rich pink gold case/bracelet. Royal Oak Double Balance Wheel Openworked. in hammered white gold. 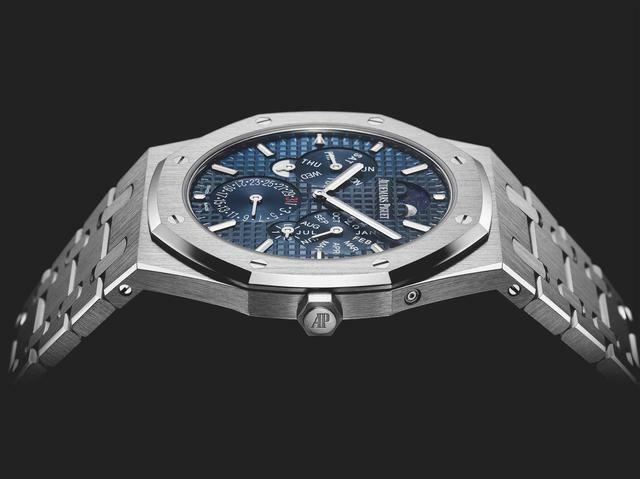 Royal Oak Concept GMT, now with a flying tourbillon. Audemars Piguet has replaced the HNR selection indicator hand with a disc on this new- generation 44mm Royal Oak Concept GMT. There are more than a few changes here that make the new version a bit bolder than earlier models. Here you’ll find a flying tourbillon (for the first time) while its central bridges, formerly made of ceramic, have been replaced with sandblasted black titanium bridges highlighted by pink gold-toned polished angles. 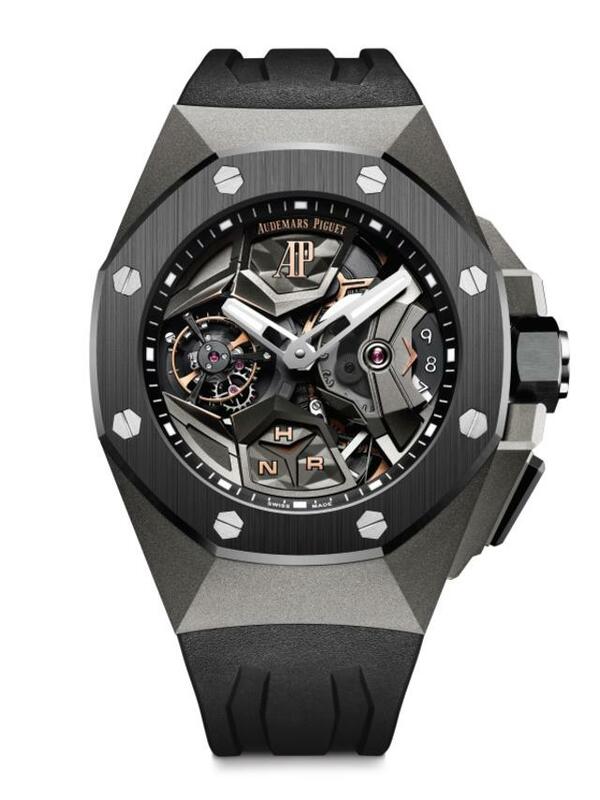 Finally, Audemars Piguet has crafted with the dial from very sleek sandblasted titanium. Deeply cut and applied pink gold-toned inserts add depth as well. The flying tourbillon at 9 o’clock features the same incredible 237 hours of power reserve as the previous Royal Oak Concept GMT model.